Every College Football season, each team from each conference has a major question that circles around the preseason progress of their potential success. The Big Ten is the only conference other than the ACC and SEC that has had a team every year in the College Football playoffs. The Ohio State Buckeyes won the first Playoff National Championship in 2014. The Michigan State Spartans joined the race in the 2015 season. In a controversial move, the playoff committee chose the Buckeyes (11-1 at the time) over the Big Ten champions in the Penn State Nittany Lions (11-2). The Buckeyes would suffer an embarrassing loss to Clemson 31-0 in the 1st round while Penn State battled USC in a Rose Bowl classic with a 52-49 loss. The East Division has made the most success recently in the Big Ten and other teams like Michigan and Penn State are ready to prove they are the team to fear in the East. This past season shows that just because you win the conference doesn’t mean you are the team to go to the playoffs. Watch for Cinderella teams like Maryland and Indiana to prove themselves as well. Here are the biggest questions that each team will be facing in the upcoming 2017 College Football season. For the past two seasons, the Hoosiers have been to a bowl game but the coach responsible for that is no longer in Bloomington. Yet the Hoosiers are not expected to decline at all. Defensive Coordinator now also Head Coach Tom Allen has to be pleased with 9 returning starters on a defense that was ranked 45th in total yards allowed per game (380). Linebacker Tegray Scales recorded 126 total tackles and 7 sacks last season. While on offense, Quarterback Richard Lagow is coming off a 3,362 passing yard season. The Hoosiers are looking for their first bowl win since December of 1991, it could very well be this year. Last season, the Terps were ranked 106th in the nation in passing yards per game (178.2). To make matters worse for the Terps offense, they have to find a starting Quarterback and two Wide Receivers. The good news is that they do return a 1,000 yard rusher in Ty Johnson, 3 stud Offensive Linemen, and a speedy Receiver in D.J. Moore. Maryland does have an incredibly tough schedule, however, with games at Texas, at Ohio State, and a cross-divisional game at Wisconsin. There is promise in the Terps especially on defense but they must have an efficient passing offense to keep up in the Big Ten. Last year was a great chance for Michigan to make an early big leap to win the Big Ten and go to the College Football playoffs. While a 10 win season is not bad for Harbaugh’s first year, it does leave them at a tough position. The Wolverines only return 1 starter on defense that was ranked 2nd in the nation in points allowed per game (14.1) and 1st in passing yards allowed per game (142.5). Michigan has 12 sophomores (6 on offense and 6 on defense) predicted to start with 11 of them with no starting experience on the depth chart. This is a young team for Harbaugh which may be tough to compete against Ohio State and a hungry Penn State team in the East division. Is this article just make you hungry for more FOOTBALL? 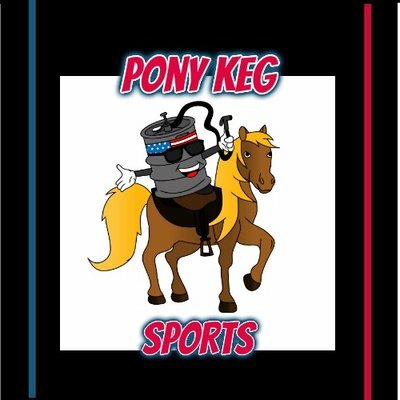 @cleatgeeks has partnered with Pony Keg Sports to bring our fans a great podcast that you can listen to anytime! Go get your #FridayFootballFix with the Pony Keg Sports Podcast as they do a complete mock fantasy draft! One of the biggest letdowns in 2016 was Michigan State especially after making to the College Football playoffs in 2015. Head Coach Mark Dantonio hopes to build back the focus that made Spartans great in the previous seasons. The depth chart is lacking players with actual starting experience. Of the 5 starters returning, C Brian Allen and RB L.J. Scott brings a heavy offensive presence in the running and passing game. The Spartans only have 3 seniors that are expected to start as well, so experience is a virtue that will need to be added later on if they want to be a threat in the Big Ten in the future. Despite that the Ohio State Buckeyes did not win the Big Ten, they got a College Football playoff spot last season. Ohio State suffered an embarrassing 31-0 loss to Clemson in the semi-finals. Not only do the Buckeyes want a playoff spot but they want revenge against other Big Ten schools. QB J.T. Barrett and RB Mike Weber lead an elite offense that was ranked 13th in points per game (39.4). The defense returns 7 defensive stars but only 1 secondary starter. If there is anything we learned from recruiting and the NFL Draft, the Buckeyes reload quickly at Cornerbacks. Ohio State remains a big favorite to win the East Division unless thrown off by a trip to Nebraska or rivals Michigan at the end of the season. What makes teams like Ohio State, Alabama, and Clemson elite is that they are elite in the stats as well as the scoreboard. Even though Penn State won the Big Ten with an 11 win season, they were average (at best) in the stats sheet. Last season, they were 21st in points per game (37.6) but were 66th in rushing yards per game (171.9) and 36th in passing yards per game (260.7). They were also 47th in points allowed per game (25.4), 48th in rushing yards allowed per game (151.3), and 50th in passing yards allowed per game (216.5). Penn State also had 6 games where they were decided by 7 points or less. If they want to further their elite status, they have to light up the scoreboard and be dominate on the stats sheet. The Scarlet Knights had no victories in the Big Ten because their offense was inconsistent as a unit. They were 127th (second to last) in points per game (15.7), 122nd in passing yards per game (138.3), and 128th (last) in total yards per game (283.2). The offense return only 5 offensive starters but did acquire former Northern Illinois and Minnesota Head Coach Jerry Kill as their Offensive Coordinator. If Kill remains healthy from his seizures, he can create a turnaround for the offense at Rutgers. The bright side is that Rutgers is 9th in the conference (out of 14 teams) in recruiting this season, most of them offensive stars. Next Story → Living that Angel Life?